Surely ALL adverts, whatever they are for, show the ideal rather than the reality? I wonder do American Companies, like American movies, hire British people to be the bad guys? Q. is this picture in any way dishonest? if so what justification could you offer for this? A. It’s not dishonest. What’s dishonest here when we are talking: It’s a ‘Marketing Tool’! Q. should recruitment brochures portray a firm as it is, or as it would like to be? A. Recruitment brochures cover both. Q. can you name any dimension of human diversity that firms might aspire to, other than employing different coloured Americans? A. You hit the nail on the head. This is where the difficulty lies i.e. defining: ‘the dimension of human diversity’. The majority of the firms are unable to walk the talk. It boils down to a check list. The bottom line is: they are a business. They want to survive and be profitable. They will look at how the law defines ‘diversity’ and its requirements. They will do the basics to meet those requirement. Thus, they are able to say: we are compliant, we belong. Heaven’s forbid they would take a real practical initiative via a deeper closer look and see if this check list really works on a grass root level?! Or may be they say oh we are bigger than other firms hence we have a higher margin of risk in implementing our business strategy (whatever their definition of risk is) to make a difference and be more diverse than most!!!! The above exmaple has nothing to do with ‘diversity’ but the analogy of application is relevant. In summary, I think ‘diversity’ gets lost in the translation of business tools and sadly ends up being a hollow ‘Marketing Tool’! Is this fair and just? What is fair and just and who should be doing what? And who pays the price for it all? A whole new problem discussion all together, Mr. Botogol, with no concrete answers but in dire need of practical solutions!!!! Regardless of the bottom line – I personally believe that businesses have moral obligations. However, I qualify this by saying it is not easy to be objective and walk the fine line to balance it all: clients, employees, law, society…so many stakeholders involved with competing diverse interests! I have never wasted an opportunity to voice the above opinion to those who can make a change with the hope that it serves as a reminder: something is not working and we need to do better. that picture is WAAAAY dishonest. 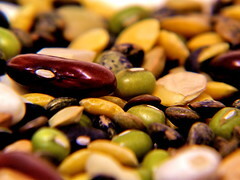 In my professional experience, most beans are brownish green and much more uniform in size. @beancounter - my favourite bean is the aduki bean. :-o Beanist! I can't believe you said that. Out loud. On a public blog.